This article is about the race course from Mario Kart 8. For Rainbow Road as a whole and other versions of the track, see Rainbow Road. Rainbow Road is the fourth and final course of the Special Cup in Mario Kart 8 and Mario Kart 8 Deluxe. 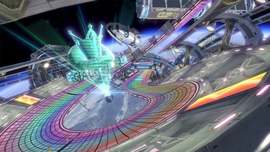 Unique from its predecessors, this incarnation takes place in a space station presumably owned by Mario Kart TV, with its multiple satellites floating, satellite-formed bleachers with audience cheering, and the road is given a new metallic design, as opposed to the transparent glass surface of previous games. It is located above the Earth's atmosphere, similar to that of Rainbow Road from Mario Kart Wii. One noticeable feature of the track is a space shuttle that resembles a Blooper which circles around the track, similar to how a flying train circles around the Lightning Cup's N64 Rainbow Road. The track itself, similar to Rainbow Road in Super Mario Kart, consists of colored square tiles, though the colors change like the Rainbow Roads from Mario Kart Wii and Mario Kart 7. The rainbow patterns are similar to that of the Mario Kart: Double Dash!! version, which mainly consists of light pink, yellow, and turquoise, though the colors now appear to be shifting within a color spectrum, similar to Dash Panels of previous installments before Mario Kart 7. Several Toads can be seen floating around the starting line, wearing spacesuits. 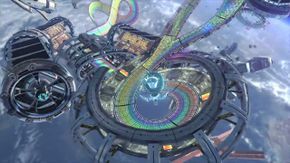 Unlike all previous renditions, this Rainbow Road is electronic and technology-themed with a futuristic design which appears more like a stadium floating in the atmosphere, instead of being a "magical" space-themed setting of other versions. This is also the only Rainbow Road track (so far) to have off-road terrain segments. The music also has a different feel to it, with more emphasis on electronic rock style. The game's producer, Hideki Konno, describes it as "spectacular." It also appears to have some influence from the F-Zero franchise, particularly when compared to the DLC course, Big Blue. The course starts from the first space station with the rainbow-colored tiles. After a turn the racers drive through the first anti-gravity section, that is 8-shaped. A gliding pad is found after the anti-gravity section and leads to the second space station with a large imprint of Mario's emblem in the entrance. It contains conveyor belts with opposite directions that changes each lap, like Toad's Factory from Mario Kart Wii. Pink Gold Peach is the Staff Ghost. At the end of the conveyor belts there is a slope with alternate Dash Panels (that turn on and off through time) and at the end of it are two gliding pads that lead to two intertwining anti-gravity sections. The gliding section consists of three boost rings that resemble Launch Stars, and it acts similarly to a cannon, though racers can slightly control their gliders. The anti-gravity paths alter in height, so if the player falls from the highest one, they can simply land on the other one. The lower path offers drivers a shortcut if they stay to the right of the Spin Boost bumper and drive off the edge. The player can see a Blooper-like spaceship orbiting around. Then the paths merge each other and the anti-gravity section ends. A 180° turn with some Dash Panels at the outermost part, like in Mario Kart Stadium, and another turn make the track loop end. At this turn the player can see a hologram projection that says "SPECIAL CUP" with its trophy logo, but only in single-player mode. The racers then return to the space station where the finish line awaits them and starts the next lap. This Rainbow Road as well as its retro counterparts, N64 Rainbow Road and SNES Rainbow Road (DLC), and GCN Baby Park (DLC) are the only courses in the game to have the map in multiple colors instead of just blue. This only applies to the Wii U version, since all four are white to match the other courses in the Switch version. There are three 8-shaped sections in this course, referencing its game, Mario Kart 8. One is right away from the starting line after exiting the large space station, and the other two are formed by the two twisting paths in the descending anti-gravity segment. Before the finish line, a screen can be seen displaying the course's map, this same detail can be found in Water Park and the GCN Yoshi Circuit DLC retro course. Screens can also be seen displaying the structure of the Blooper space shuttle. This page was last edited on January 1, 2019, at 12:03.